The French external intelligence agency spies on French citizen’s phone calls, emails and social media activity and web use, the Le Monde newspaper has reported. France’s external intelligence agency the DGSE, intercepts signals from computers and telephones in France and between France and other countries in order to get a pictures of who is talking to whom, although, apparently, they do not randomly spy on the content of phone calls, the daily revealed on Thursday. Emails, text messages, telephone records, access to Facebook and Twitter are stored for years. “All of our communications are spied on,” read the article quoting unnamed sources in the intelligence services as well as remarks made publicly by intelligence officials. The DGSE allegedly stores the metadata from private communications in a basement under its Paris headquarters. All of France’s seven other intelligence services have access to the data and can tap into it freely as a means to spot people’s suspicious communications. Individuals can then be targeted by more intrusive techniques such as phone-tapping, it was reported. 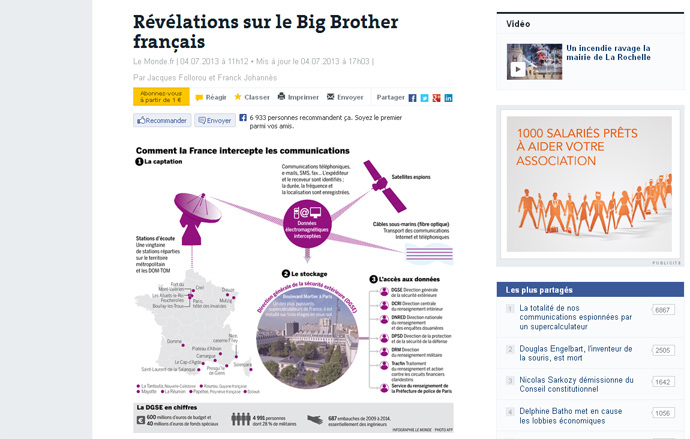 Le Monde pointed out the activities were illegal, but the French national security commission whose job it is to authorize targeted spying, and the parliamentary intelligence committee, challenged the papers report. It said that it works within the law and that the only body in France that collected communication information was a government agency controlled by the Prime Minister’s office to monitor for security breaches. The report comes after revelations that America’s NSA regularly spies on its own people as well as on European citizens and embassies. The allegations were leaked by Edward Snowden and published in the German magazine Der Spiegel, and have sparked a furious response from European governments just as a major US-EU trade talks are about to get underway. The Guardian newspaper reported last month that Britain has a similar spying program and shares vast quantities of information with the NSA through its Prism program.